When it comes to driving safely, most of us focus our attention on how to react to other vehicles on the road, whether that’s a car, motorcyle, or bicycle. But there’s another important group you may be forgetting: pedestrians. Each year, nearly 5,000 people across the US are killed in motor-vehicle-related accidents, according to the National Highway Traffic Safety Administration. An additional 75,000 suffer injuries. These numbers come only from accidents that occur on public roadways, so that doesn’t include any car-related injuries that may occur on private land. Why is pedestrian safety so vital? Car accidents can be devastating, of course, but vehicle passengers have some protection within the car’s frame and with seatbelts. Pedestrians are unprotected, so their resulting injuries are often catastrophic. Additionally, the most vulnerable pedestrians are children and people with disabilities; they may be less aware of their surroundings and less able to react quickly in an emergency situation. The topic of pedestrian safety seems fraught with misconceptions, and today we’d like to debunk two of them. No matter how you like to travel, whether that’s in a car, on a motorcycle or bicycle, or on foot, it’s important to understand and obey the Arkansas laws related to pedestrians. Safety begins with awareness! Myth #1: Pedestrians ALWAYS have the right-of-way (in other words; pedestrians rule the road). It’s true that drivers ALWAYS have a duty to exercise caution and take “due care” to avoid striking any pedestrian, regardless of whether a crosswalk is present. However, Arkansas law states that if a person is trying to cross a roadway outside of a marked or unmarked crosswalk at an intersection (i.e. anywhere other than a marked crosswalk or intersection), he or she must yield right-of-way to the vehicles. You may see how this could become a complicated issue if a pedestrian is struck by a vehicle outside of a crosswalk area. The pedestrian failed to yield right-of-way, but the driver failed to exercise due care in avoiding the person. Avoid taking this risk and cross only in marked crosswalks or intersections, and never assume that a car is going to stop, even if required by law. Myth #2: Drivers are only required to stop or yield for pedestrians if a crosswalk is clearly marked with paint or signs. There are two types of crosswalks: marked and unmarked. The concept of an unmarked crosswalk is often misunderstood. Generally, any intersection (where two roads cross at right angles) is understood to be an unmarked crosswalk. An unmarked crosswalk is found where the sidewalk would naturally extend into the road. Arkansas law requires drivers to stop for pedestrians at any marked OR unmarked crosswalk – that includes street corners in small towns where there may be no traffic signals or lights. You may be driving through unmarked crosswalks each day without ever realizing it! This is particularly important in more rural areas, where there may be few traffic signals, and on college campuses where there is heavy foot traffic. 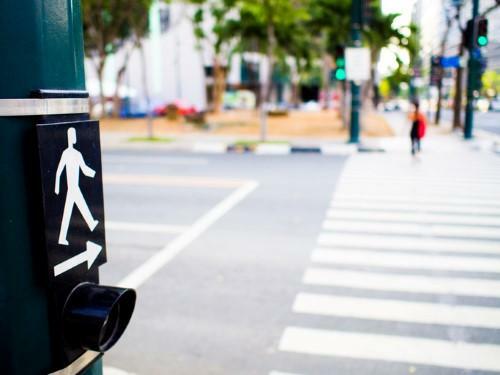 While all 50 states have laws concerning pedestrian crossings and crosswalks, each state is different. To get an overview of your own state’s specific laws, take a look at this 50 State Summary from the National Conference of State Legislatures. If you or someone you love has been injured in a motor vehicle accident where a car failed to yield to you as a pedestrian, you may have legal rights to compensation. The personal injury lawyers at Taylor King Law work every day to help Arkansas accident victims like you. We help all victims of car accidents, and that includes pedestrians and bicyclists. When you call 1-800-CAR-WRECK, you’ll get a free consultation with Taylor King, whether or not you hire our firm. We’ll be on your side, by your side, every step of the way. You’re one call away from getting help today!